The effects of twist and section shape modifications in the inboard region on the aerodynamic characteristics of the NREL 5 MW rotor have been examined using a Reynolds-averaged Navier–Stokes method OVERFLOW2. The baseline rotor blade was modified by increasing the trailing-edge thickness over the inboard region by modifying the sections’ thickness distribution aft of the maximum thickness location. Results when compared with the baseline rotor show that a modest increase of trailing-edge thickness to 10–20%c increased power capture by 1%. Further increases in trailing-edge thickness decrease in effectiveness to the point of reducing power capture when thicknesses reach 40%c. Increasing trailing-edge thicknesses also leads to an increase in thrust, but this load is concentrated in the inboard region, resulting in a small increase in root bending moments. The blunt trailing-edge concept greatly reduces the spanwise extent of inboard flow separation evident in the baseline NREL 5 MW rotor. The low-pressure region aft of the trailing edge, created by the geometry, acts to reduce the spanwise spreading of the inboard separation. Rotors with modified twist distributions over the inboard 35%R of span are also compared. Inboard twist angles are varied from C6° to 6° from the baseline twist schedule. Increasing inboard blade twist reduces overall rotor power capture but reduces thrust at a faster rate. Power capture remains constant with decreasing inboard geometry twist, whereas thrust increases approximately linearly by 0.75% for a decrease in thrust of 6°. 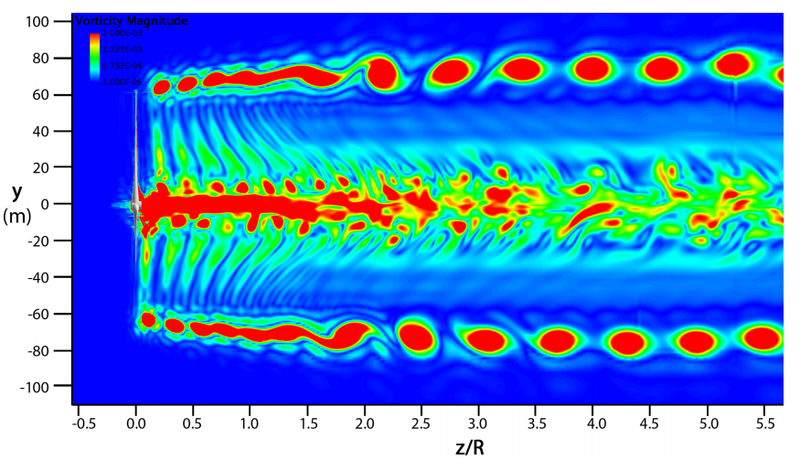 Flow around an airfoil with a deploying microtab device has been numerically simulated by solving the unsteady turbulent compressible Navier–Stokes equations with the OVERFLOW-2 solver. Using a Chimera/overset grid topology, microtabs were placed at 95% of chord of a symmetric NACA 0012 airfoil. Microtab heights on the order of 1% of chord, deployed on the order of one characteristic time unit were utilized. The unsteady effects of tab deployment time, deployment height, and freestream angle of attack on aerodynamic responses were also investigated. Validation studies with experimental results for static deployed microtabs and a dynamically deployed spoiler were also performed to ensure accurate temporal and spatial resolution of the numerical simulations. Small, actively controlled tabs that deploy normal to an airfoil’s surface (microtabs) and actively controlled jets that blow normal to the surface (microjets) have been proposed as potential mechanisms to provide aerodynamic load control on wind turbine blades. This paper describes the results of wind tunnel tests of each device, installed in the same airfoil model. Microtabs and microjets were located at 90% chord on the suction surface and 95% chord on the pressure surface of the airfoil. The devices were tested under steady flow conditions at a Reynolds number of one million, as well as being deployed during simulated wind gusts. Microtabs were found to mitigate the increase in lift caused by a 10 mph gust. Effectiveness, time response, and operational considerations are compared for both devices. A study has been conducted to improve the correlations within a computational roughness amplification model implemented in the unsteady RANS solver OVERFLOW-2. The model extends the Langtry-Menter transition model by introducing an additional scalar field roughness amplification quantity, Ar. This additional variable and transport equation allows non-local effects of surface roughness to be accounted for downstream of rough sections. Initially the model was not equipped to account for the influence of a strong local pressure gradient and experiments have shown discrepancies compared to predictions from the model. Accordingly, the model has been reformulated to include the effects of localized pressure gradients. Additionally included are suggestions for accounting for changes in roughness density. With the equations governing the roughness model recast, the model has been calibrated using the results from the companion experimental study performed at Texas A&M University. An overview of the experimental campaign is provided along with results of the roughness amplification model applied to the configurations tested. 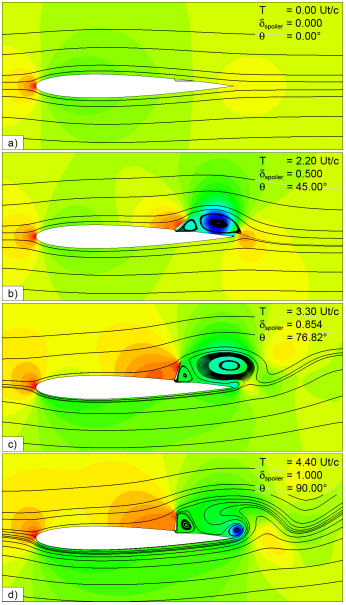 Flow around an S819 airfoil, which has been modified to have microjets near the trailing edge on both the pressure and suction surfaces, has been studied in both a wind tunnel and using the two-dimensional Reynolds-averaged Navier-Stokes solver OVERFLOW-2. Microjets are small jets of air blowing normal to the airfoil surface that can affect its aerodynamic properties such as lift, drag, and pitching moment. 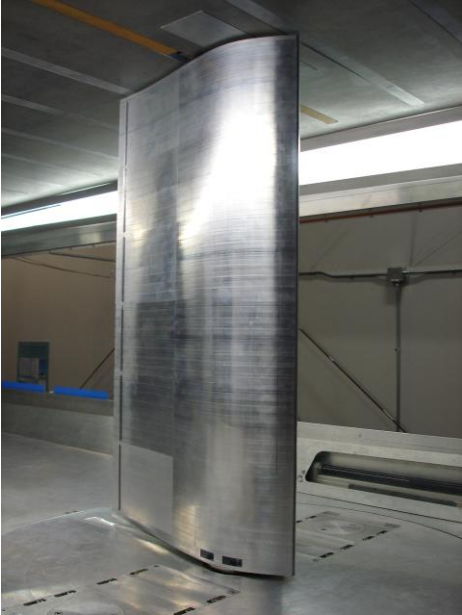 A ducting and plenum system was designed and built, the microjets’ effects were measured in the UC Davis Aerodynamic Wind Tunnel, and the results are compared to time-accurate CFD simulations. Initial tests show the experimental system compares favorably to simulations, with the suction surface jets able to measurably decrease the lift across a range of positive angles of attack. However, a high enough flow rate was not achievable with this system’s air supply to measurably increase the lift using the pressure surface jets. The aerodynamic characteristics of the NREL 5-MW rotor were examined using two numerical simulation tools, an unsteady Reynolds-averaged Navier-Stokes method and a large eddy simulation method. OVERFLOW2 is a fully viscous, 3-D, Reynolds-averaged Navier-Stokes method. SOWFA (Simulator for Offshore Wind Farm Applications) is a wind farm simulation tool based on a large eddy simulation (LES) methodology with a line actuator method to represent rotor forces. Three laminar, steady, and uniform wind speed cases spread over the operating range of the NREL 5-MW turbine were simulated with OVERFLOW2 and SOWFA. The aerodynamic behavior predicted by each of the simulation tools was then analyzed and compared. The primary focus of the study was to compare the rotor wake behavior predicted by each simulation tool. The OVERFLOW2 and SOWFA results were found to have fairly good agreement, though there were some discrepancies. Additional SOWFA simulations were carried out to examine the effect of the size and resolution of the near-wake grid. The downstream length of the near-wake grid had only a small effect over the range examined. 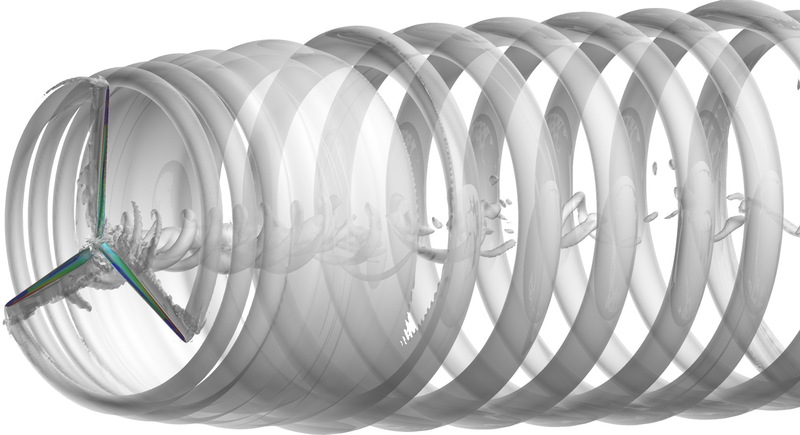 The grid resolution had a larger effect on turbine and wake behavior. S. Johnson, S. Larwood, G. McNerney, C.P. van Dam, BALANCING FATIGUE DAMAGE AND TURBINE PERFORMANCE THROUGH INNOVATIVE PITCH CONTROL ALGORITHM, Wind Energy, Vol. 15, No. 5, 2012, pp. 665-825. S. Larwood, C.P. van Dam, DYNAMIC ANALYSIS TOOL DEVELOPMENT FOR SWEPT WIND TURBINE BLADES, accepted for publication in Wind Energy, 2012. S.J. Johnson, J.P. Baker, C.P. van Dam, D.E. Berg, AN OVERVIEW OF ACTIVE LOAD CONTROL TECHNIQUES FOR WIND TURBINES WITH AN EMPHASIS ON MICROTABS, Wind Energy, Vol. 13, No. 2-3, 2010, pp. 239-253. S. Saephan and C.P. van Dam, DETERMINATION OF WING-ONLY AIRCRAFT TUMBLING CHARACTERISTICS THROUGH COMPUTATIONAL FLUID DYNAMICS, Journal of Aircraft, Vol. 45, No. 3, May-Jun. 2008, pp. 1044-1053. D.D. Chao and C.P. van Dam, COMPUTATIONAL AERODYNAMIC ANALYSIS OF AN INBOARD BLUNT TRAILING EDGE MODIFICATION TO THE NREL PHASE VI ROTOR, Wind Energy, Vol. 10, No. 6, Nov-Dec. 2007, pp. 529-550. J.P. Baker, K.J Standish, and C.P. van Dam, TWO-DIMENSIONAL WIND TUNNEL AND COMPUTATIONAL INVESTIGATION OF A MICROTAB MODIFIED AIRFOIL, Journal of Aircraft, Vol. 44, No. 2, Mar-Apr. 2007, pp. 563-572. J.P. Baker, E.A. Mayda, and C.P. van Dam, EXPERIMENTAL ANALYSIS OF A THICK BLUNT TRAILING EDGE WIND TURBINE AIRFOIL, Journal of Solar Energy Engineering, Vol. 128, No. 4, Nov. 2006, pp. 422-431. D.D. Chao and C.P. van Dam, WING DRAG PREDICTION AND DECOMPOSITION, Journal of Aircraft, Vol. 43, No. 1, Jan-Feb. 2006, pp. 82-90. Chow, R., and van Dam, C.P., “Inboard Stall and Separation Mitigation Techniques on Wind Turbine Rotors,” AIAA-2011-152, 49th AIAA Aerospace Sciences Meeting, Orlando, FL, Jan. 2011. Cooperman, A.M., Chow, R., Johnson, S.J., and van Dam, C.P., “Experimental and Computational Analysis of Wind Turbine Airfoil with Active Microtabs,” AIAA-2011-347, 49th AIAA Aerospace Sciences Meeting, Orlando, FL, Jan. 2011. Chow, R., and van Dam, C.P., “Analysis of Inboard Flow Separation on Wind Turbine Blades,” Torque 2010, 3rd EAWE (European Academy of Wind Energy) Conference, Heraklion, Greece, Jul. 2010. Blaylock, M., Chow, R., and van Dam, C.P., “Comparison of Microjets with Microtabs for Active Aerodynamic Load Control,” AIAA-2010-4409, 5th AIAA Flow Control Conference, Chicago, IL, Jun. 2010. Cooperman, A.M., McLennan, A.W., Chow, R., Baker, J.P., and van Dam, C.P., “Aerodynamic Performance of Thick Blunt Trailing Edge Airfoils,” AIAA-2010-4228, 28th AIAA Applied Aerodynamics Conference, Chicago, IL, Jun. 2010.
van Dam, C.P., Cooperman, A., McLennan, A., Chow, R., and Baker, J.P., “Thick Airfoils with Blunt Trailing Edge for Wind Turbine Blades,” Proc. of the ASME Turbo Expo 2010, Jun. 2010. Yoo, S.Y., Chow, R., Mayda, E.A, and van Dam, C.P., “Integrated Method of CFD and Grid Generation for Automatic Generation of Airfoil Performance Tables,” AIAA-2008-1332, 46th AIAA Aerospace Sciences Meeting, Reno, NV, Jan. 2008. Berg, D.E., Zayas, J.R., Lobitz, D.W., van Dam, C.P., Chow, R., Baker, J.P., “Active Aerodynamic Load Control of Wind Turbine Blades,” Proc. of the 5th Joint ASME/JSME Fluids Engineering Conference, FEDSM2007-37604, San Diego, CA, 2007.
van Dam, C.P., Chow, R., Zayas, J.R., and Lobitz, D.W., “Active Load Control of Wind Turbine Blades Using Small Tabs or Flaps,” AWEA (American Wind Energy Association) Windpower 2007, Los Angeles, CA, June 2007.
van Dam, C.P., Chow, R., Zayas, J.R., and Lobitz, D.W., “Active Aerodynamic Load Control of Blades Using Small Tabs or Flaps,” 2007 European Wind Energy Conference, Milan, Italy, May 2007. Chow, R., and van Dam, C.P., “Unsteady Computational Investigations of Deploying Load Control Microtabs on a Wind Turbine Airfoil,” AIAA-2007-1018, Jan. 2007. Zayas, J.R., van Dam, C.P., Chow, R., Baker, J.P., and Mayda, E.A.,, “Active Aerodynamic Load Control for Wind Turbine Blades,” 2006 European Wind Energy Conference, Athens, Greece, Feb. 2006. Chow, R., and van Dam, C.P., “Unsteady Computational Investigations of Deploying Load Control Microtabs,” AIAA-2006-1063, 44th AIAA Aerospace Sciences Meeting, Reno, NV, Jan. 2006. Chow, R., and van Dam, C.P., “Analysis of Airfoil Surface Temperature Distributions at High Altitude Conditions,” NASA Contractor Report, Dec. 2003.